A pair of chip teardown firms this weekend stripped down the new A5 system-on-a-chip used in the Apple's iPad 2, finding that the package is indeed being manufactured by Samsung. Several rumors in recent weeks have claimed that Apple is shifting production from Samsung to TSMC, and while that may still be the case for future production, Samsung is clearly responsible for early production runs. UBM Techinsights performed a complete teardown of the iPad 2, with a special focus on decapsulating the A5 package. Based on analysis performed by UBM TechInsights Lab and Process Analysis personnel, we can say that the A5 in our possession is definitely manufactured by Samsung using their 45nm process. 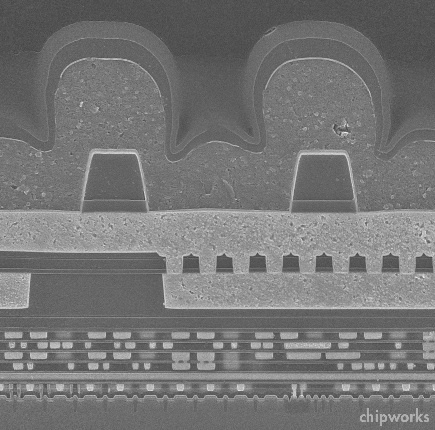 UBM TechInsights used optical die and SEM cross-section images to analyse important features such as die edge seal, metal 1 pitch, logic and SRAM transistor gate measurements. These features were then compared to other manufacturers in our database, including other Samsung 45nm parts. The previous generation Apple A4 processor was also fabbed on Samsung's 45nm process. UBM TechInsights also discovered that the A5 packages from two iPad 2 units used DRAM from two different sources, Samsung and Elpida, indicating that Apple has tapped multiple suppliers even for portions of the complex A5 package in order to meet demand. Chipworks has also performed a decap of the A5, similarly revealing that the package is being manufactured by Samsung. At this scale even electron microscopes start to run out of steam, so not the clearest of images in either case, but good enough to see the similar shape of the transistor gates and the dielectric layers. 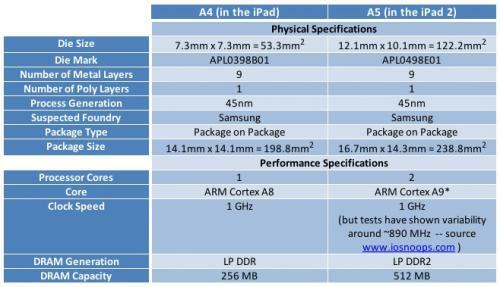 So at least this sample of the A5 is fabbed by Samsung, just as all Apple's processor chips have been for the last while. Also of interest, iOSnoops discovered that the while the A4 chip found in the original iPad clocked in at a consistent 1 GHz, each of the two cores in the new A5 seems to run at a variable speed between 861 MHz and 894 MHz depending on the app being run, suggesting that Apple has built in more advanced power management features for the A5.